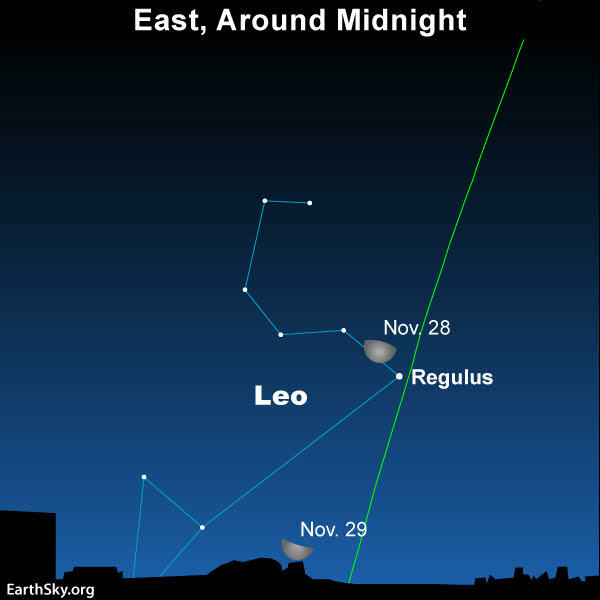 On November 28 and 29, 2018, you’ll have to stay up late, or get up before dawn, to see the waning moon coupling up with Regulus, brightest star in the constellation Leo the Lion. The two luminaries will be highest up for the night at or near dawn. As darkness is giving way to dawn, notice the relationship between the moon, Regulus, and a very bright object in the direction of sunrise. Venus is the third-brightest object in the sky after the sun and moon. If you’re up before dawn, you might also see the 1st-magnitude star Spica near Venus (which Venus outshines by well over a hundredfold). 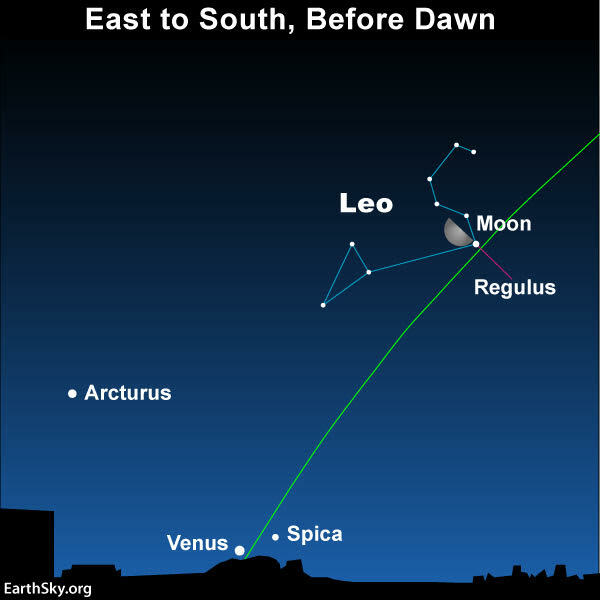 The lighted portion of the moon will be pointing toward Venus and Spica, the constellation Virgo’s brightest star, on Thursday and in the coming mornings, as shown on the chart below. The green line on our sky charts is the ecliptic – Earth’s orbital plane projected onto the constellations of the zodiac. Because the planets orbit the sun, and the moon orbits Earth, on nearly the same plane that Earth circles the sun, the moon and planets are always found on or near the ecliptic. If you’re an early bird, waking up before the sun, then use the moon, the star Regulus and the dazzling planet Venus to help you envision the ecliptic with the mind’s eye in late November and early December 2018. The size of the moon is greatly exaggerated in this chart! Day by day, before dawn, watch for the waning moon to sink toward Venus and to meet up with this dazzling world in early December 2018. 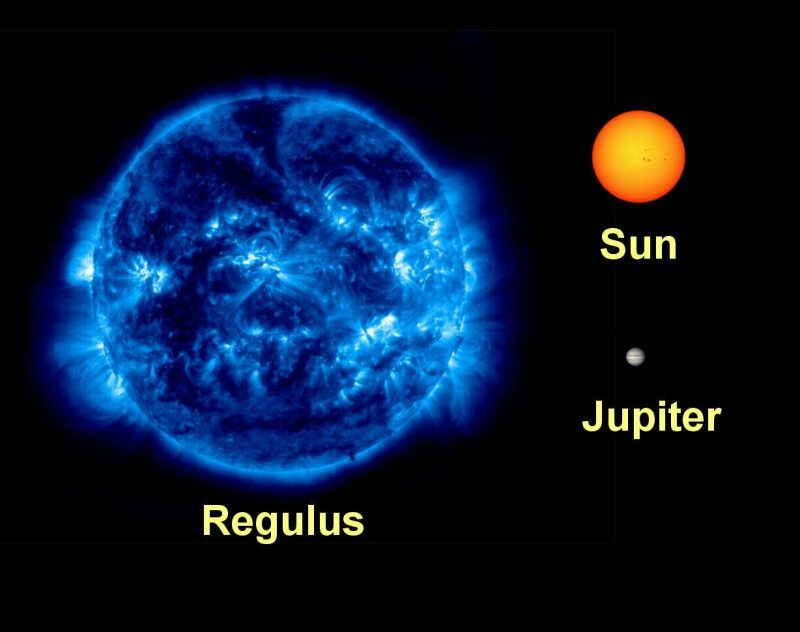 Regulus is the only first-magnitude star to sit almost squarely on the ecliptic, which marks the path of the sun, moon and planets across our sky. In our day and age, the sun’s yearly conjunction with Regulus happens on or near August 23. That’s about two months after the June solstice, or about a month before the September equinox. Early astronomers thought the sun literally moved through the constellations of the zodiac, while the Earth remained at rest at the center of the universe. Of course, we now know that the Earth revolves around the sun, and that the sun resides at the center of our solar system. We also know that the sun’s apparent daily motion in front of the backdrop stars is really a reflection of Earth’s movement in orbit around the sun. When you see Regulus near the moon on the mornings of November 28 and 29, 2018, remember … it’s a much larger star than our sun. Image via The Night Sky Guy. Bottom line: See the waning gibbous moon near Regulus from around midnight until dawn. Then watch over the coming mornings as the moon moves past Regulus and toward the planet Venus.